Where are the Catholic Churches located in Ponta Delgada, when we get off our Princess cruise ship Sunday in late October? Would you know the times of the Masses? Sorry for the delay in my response. Hopefully you see this in time for your trip. 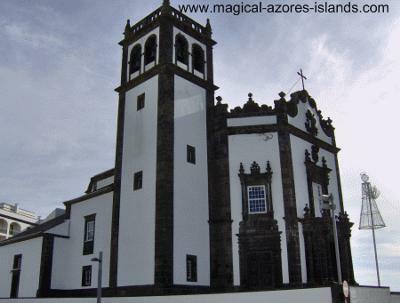 There are two Catholic church's close by the location that you will dock by in Ponta Delgada. The first, Sao Pedro, is right across from Portas do Mar. I have attached a picture. The second, Sao Sebastian, is a very nice 5 to 10 minute walk down the avenue to the City Gates. I have attached a picture of this one as well. Sao Sebastian is likely your best option as it has several masses a day. I do not know the times off hand, but perhaps a friend of www.magical-azores-islands.com will comment and inform us both! Enjoy your stop in Ponta Delgada Azores! What's times mass are there. It is important for metal. Been looking high and low on the internet and various sites for WHEN are masses on Sat or Sun on Teceira ? We will be there from March 15-21 ... thank you for any information. Dear friends, I am looking to buy a church building in Azores. Large ruin would also suffice. Your best option is Sao Sebastion church. It is easily found near the cruise terminal (known as Portas do Mar). Sao Sebastion church is a short walk down the avenue - turn left after you depart the boat. And follow the avenue until you see the "City Gates". The church is right behind those gates. I'll try and post a couple of pictures here for you to see what the city gates and the church look like.